The School of Civil and Construction Engineering at OSU won a BUILD Magazine award for promoting and supporting women in the construction industry. Dr. Fischer was interviewed about the department and the award in the Daily Journal of Commerce. Dr. Fischer is a member of the NCSEA Structural Engineering Engagement and Equity Committee. This committee developed a survey for the structural engineering community and it is now live! This will be the most comprehensive survey of the structural engineering community to date and result in information regarding why people are leaving the profession, what attributes employees find most valuable at their company, and if there are any differences between men and women. Find the survey here. Resilience officers from all over the world will be coming together to learn and talk about how Mexico City will incorporate resilient strategies to recover from the September 19 earthquake. Dr. Fischer is a member of the ASCE Infrastructure Resilience Division team that is investigating the impacts the 2017 Oregon wildfires have had on lifelines. She participated in the first of many trips to the regions impacted to look at the impacts the wildfires have had on transportation and power. Dr. Fischer organized a seminar on Lessons Learned from the 2017 Mexico City Earthquake. 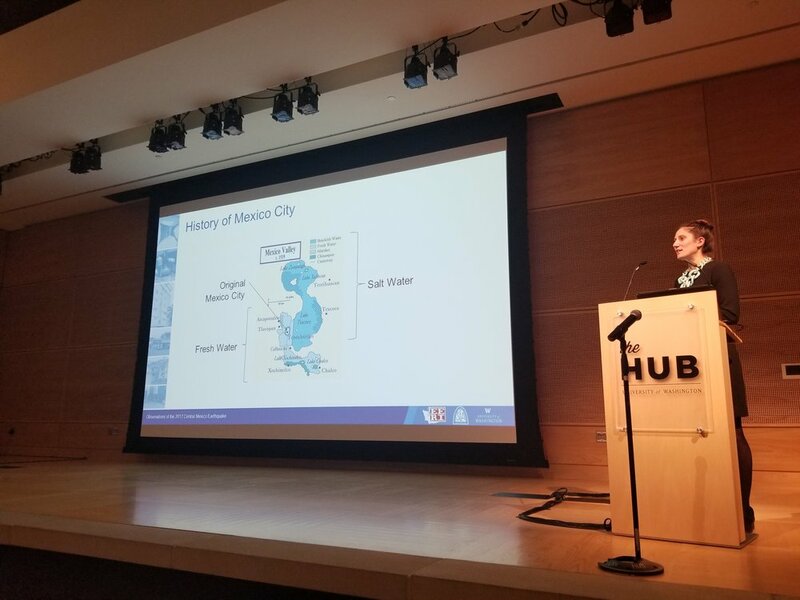 Eight speakers from Seattle and Portland were invited to speak about their earthquake reconnaissance experience in the context of what engineering in the Pacific Northwest can learn from the 2017 Mexico City Earthquake. The seminar was concluded with a representative from the Portland Bureau of Emergency Management presenting pre-disaster mitigation initiatives that they are implementing to improve the resiliency of the City of Portland. Thank you to all of the speakers and to all of the attendees that came! Structural Materials and Global Climate is a primer on greenhouse gas emissions for the structural engineering community, focusing on the impact of structural materials and systems. Building construction and use contribute more than 40% of human-caused emissions of greenhouse gases. Structural engineers can play a leading role in reducing carbon emissions by designing structures that emit fewer of these gases during construction, throughout building use, and at end of building life. This report explains the science behind climate change and practical ways structural engineers can help reduce the carbon footprint of buildings. The report sets the stage with an introduction and overview of climate change science. It then examines how buildings contribute to climate change and introduces life-cycle assessment (LCA) methodology. The report reviews the variability and uncertainties associated with LCA, and then explores LCA data sources and tools, as well as how LCA is incorporated into green rating systems and codes. The carbon dioxide impact of five primary structural materials (concrete, masonry, structural steel, wood, and fiber-reinforced polymers) are assessed, with guidance on how structural engineers can reduce that impact. A final chapter demonstrates how LCA may be used to understand the carbon dioxide impact of three alternative structural floor framing systems. Structural and architectural engineers, as well as architects, construction managers, and building owners, will consult this report for accurate, practical recommendations on reducing emissions that cause climate change. The Earthquake Engineering Research Institute (EERI) is hosting a Learning from Earthquakes Webinar on the Mexico Earthquake Reconnaissance on Tuesday, November 14 from 9-11 am PST. Dr. Fischer will present on lifelines along side many other experts who performed reconnaissance after the earthquake. Register for the webinar here. Dr. Fischer was interviewed for the Daily Journal of Commerce in Portland to talk about her recent trip to Mexico City to study water infrastructure after the latest September 19 earthquake. She discusses what she learned and how she is applying it to research on water infrastructure in Oregon. Check out the article here. Dr. Fischer discusses why earthquake reconnaissance is important and how the facilities at Oregon State University can contribute to research in infrastructure renewal and resislient communities: watch here. Dr. Erica Fischer talked about resilient communities to editor John Caulfield of Building Design + Construction Magazine. She is quoted talking about the mandatory seismic retrofits in southern California and the Bay Area in an article that discussed the overwhelming number of organizations and companies that are addressing resilient design. She also discusses some of the strategies that Oregon is implementing with regards to making schools more resilient in an article that talks about specific strategies cities are taking. Dr. Fischer leads the Disaster Resilience Working Group for the ASCE/SEI Sustainability Committee and has co-authored articles about disaster resilience in Structures Magazine. Dr. Erica Fischer traveled to Mexico City after the September 19, 2017 earthquake to perform earthquake reconnaissance. She focused on the performance of water infrastructure, buildings, and the response of the structural engineering community. To learn more about her experiences, read her blog on the Reid Middleton website or check out her twitter posts: @erica_fischer.